Do you have a few pieces of scrap wood and some rope? If you do, then you have a lot of things that you can make to use around your home. 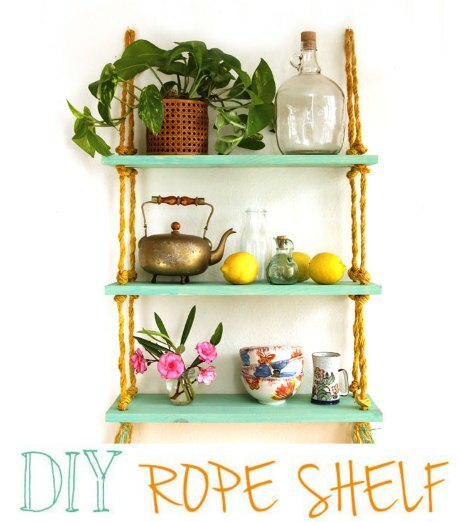 An awesome idea is to make a rope shelf that you can place on any wall or hang from the ceiling. If you are familiar with a rope swing, then a rope shelf is really similar. You will make knots to support the shelf if you hang it from the ceiling or against a wall. The number of shelves you add may depend on the height of the ceiling or your personal preference. A power drill is the only tool you need to make a rope shelf for your home. You may find this is a great item to make as a gift that does not cost too much money. The main thing you need to do is decide if you will paint or stain the wood for your shelves.